President Obama on Thursday formally endorsed Hillary Clinton for president, shortly after holding a meeting with her competitor Sen. Bernie Sanders (I., Vt.). The endorsement came days after Clinton clinched the nomination by exceeding the number of delegates needed to win the Democratic primary. "I want to congratulate Hillary Clinton on making history as the presumptive Democratic nominee for president of the United States. Look, I know how hard this job can be. 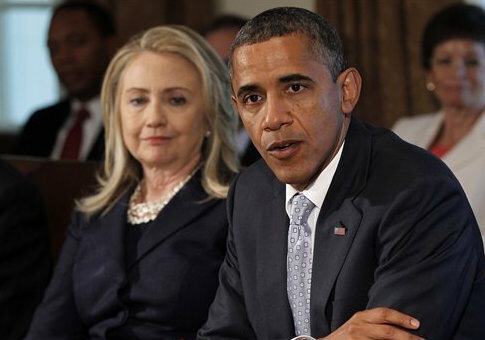 That’s why I know that Hillary will be so good at it," Obama said in a video posted to Clinton’s campaign website. "In fact, I don’t think there’s ever been someone so qualified to hold this office. She’s got the courage, the compassion, and the heart to get the job done." Obama celebrated Clinton’s "judgment" and "toughness" she displayed as secretary of state during his administration, a position that she accepted after losing to him during the 2008 Democratic primary. "I am fired up and I cannot wait to get out there and campaign for Hillary," Obama said. The president also described the primary as a "hard-fought race" and thanked Sanders for bringing new voters to the polls. "I know some say these primaries have somehow left the Democratic Party more divided. Well, they said that eight years ago as well," Obama said. "But just like eight years ago, there are millions of Americans, not just Democrats, who’ve cast their ballots for the very first time. And a lot of that is to Sen. Bernie Sanders who has run an incredible campaign." Obama, who sat down with Sanders on Thursday, described the meeting as "great" in the video message. He said he thanked Sanders for spotlighting issues such as economic inequality and the influence of money in politics during his campaign. "Embracing that message is going to help us win in November," Obama said. Following the meeting Thursday, Sanders said he would stay in the race through the Washington, D.C., primary next week. He also indicated he expects to "work together" with Clinton in the future. Clinton will face presumptive GOP nominee Donald Trump in the general election.